KFC Coleslaw is some of the best coleslaw around. This recipe was created by Bill Cosby (Bill Cosby from Missouri, not the actor/comedian). 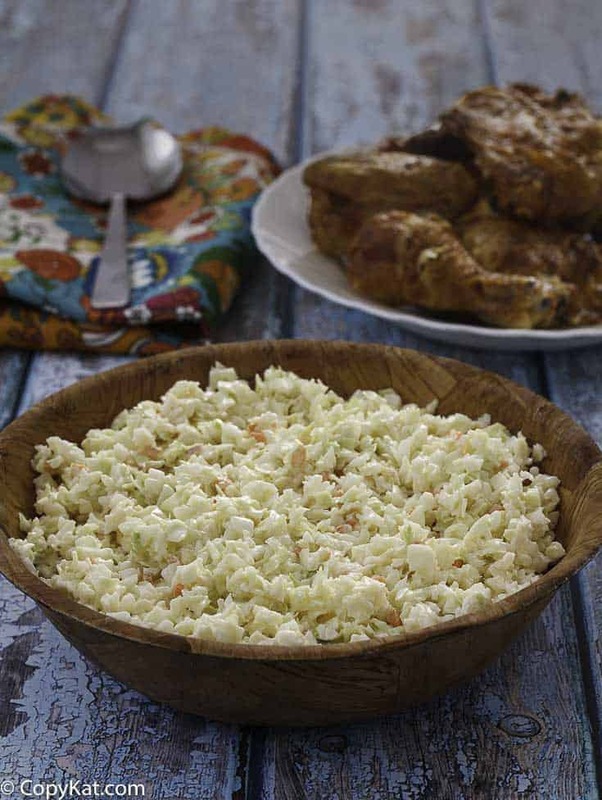 This KFC Coleslaw recipe is one of the oldest recipes on copykat.com – it’s been online here for more than 20 years, and, honestly, it’s one of the best recipes on the site. Please note there is no bell pepper in the KFC recipe. This is an optional suggestion only to add the bell pepper to the recipe. 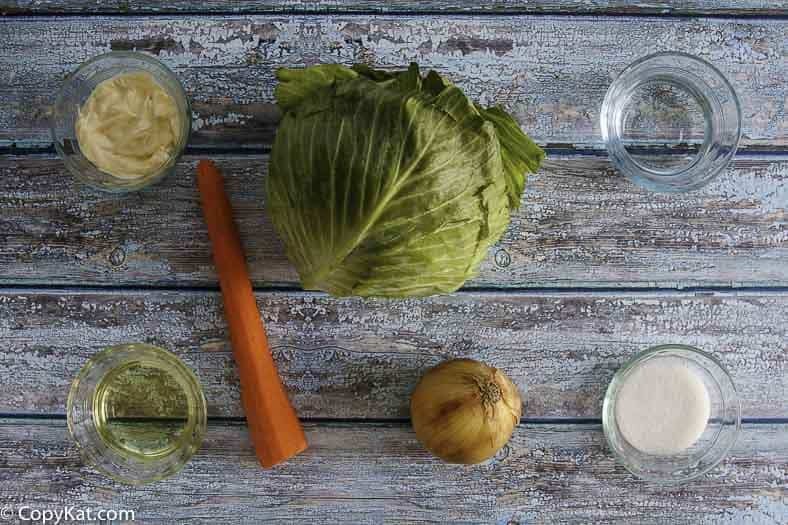 My recipe is an incredibly easy way to make homemade coleslaw. If you have never made one of my recipes before, never fear – I promise, this one really is easy. I think that if you cut everything by hand, you can get it closer to what is served in KFC. However, you can use a food processor if you like to chop all of these vegetables. It’s also ok to buy a package of coleslaw mix to avoid chopping altogether. However, the mix you buy in the store has the cabbage core in it which will give the coleslaw a somewhat different taste. Please note: There is no bell pepper in the KFC Coleslaw. This is an optional suggestion only to add the bell pepper to my recipe. Please do not use mayonnaise: This Kentucky Fried Chicken coleslaw recipe is made with Miracle Whip This recipe requires Miracle Whip, which has a nice sweetness. If you use mayonnaise, your recipe will taste like every ordinary coleslaw in your grocery store. KFC Coleslaw became famous because it had less of a vinegary taste to it and more sweetness than other coleslaws. If you go changing it around, you can’t expect it to taste the same. Make ahead of time: It’s important to let the slaw sit and steep in its juices for a minimum of one hour before serving. The longer it steeps the better it’s going to taste. I like to make this coleslaw a day or two before I need to serve it because the flavors get the chance to marry and improve. Option to use tarragon vinegar: I am told by former KFC employees that you can use tarragon vinegar for a more authentic taste. However, I have made this more times than I can count with regular white distilled vinegar. Love KFC? Try these KFC Copycat Recipes. Yum – this is the perfect side dish for many dishes. I believe there used to be an ad saying something like: “Come to Kentucky Fried Chicken for food that is as good as you get at home!” Now, you can make food at home that is even better than what you get at KFC – Col. Sanders better watch out! 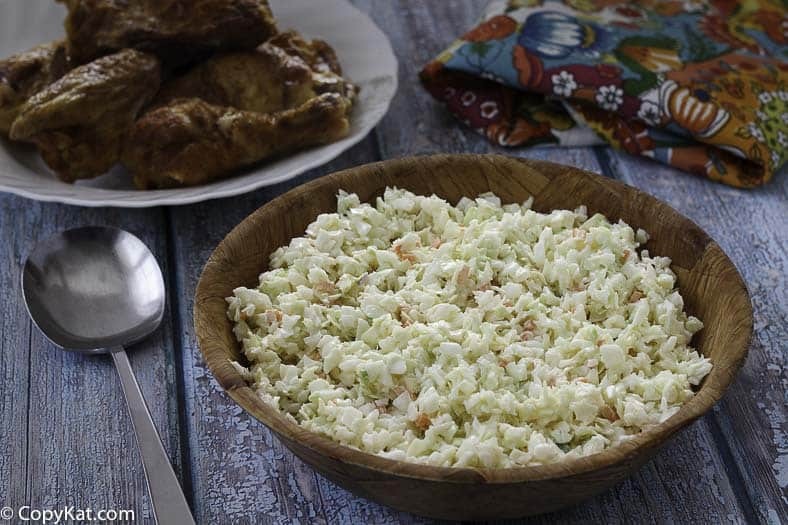 I love to bring this coleslaw to a special event; the bowl always comes home empty. And, even if you have a family member who doesn’t like coleslaw, they’ll come back for seconds. You can make homemade cole slaw that tastes even better than KFC. If you are lucky enough to have a food processor, get it out of your cupboard. Start to cut up the cabbage and place it in the processor. While cutting up the cabbage, also cut up small slices of green pepper, onion, and carrot and add to the processor. Mixing up the ingredients this way will help distribute the flavors throughout the slaw. You should only use 1/4 to 1/2 of the onion and green pepper but use all of the carrot. If you truly love green pepper and/or onion you can add it all but I do not recommend it. Now mix Miracle Whip, vinegar, oil, and sugar until you have a smooth mixture. Taste should be sweet with just a hint of vinegar. Amount of dressing may be increased or decreased according to the amount of slaw you are making. Add to cut up veggies and mix well. Let stand at least one hour to let flavors mix. Love to be able to make this at home, so good! So happy to have this recipe! I love it! Looks so easy to make!